I had a very bizarre dream last night involving the One Ring To Rule Them All from Lord Of The Rings. In said dream, I had somehow come across the one ring of power. For some reason, the ring wasn’t evil and didn’t tempt my soul or anything. Quite the opposite, as I wanted to sell the magical ring for a crap ton of money. I had duplicates of the ring for some reason, not sure why. A couple of my friend grabbed the duplicates and attempted to get the actual ring from me. I ran off and started checking my backpack, so I can have the One Ring in my possession and make sure no one else takes it. I search through my backpack and find at least 20 different rings, some of which don’t even look like The Ring from the movie. Heck, some of them had what appeared to be Arabian text on them rather than the fictional language inscribed on them in the film. After trying on many different rings and finding none of them to be the legit article, I ended up waking up. What was weird about the dream is that it felt semi-realistic. I actually felt as though I was putting the rings on my finger in the dream, it was almost like a lucid dream. Author’s Note: This is a net fiction series that I’m starting, it’s styled like a superhero story in a way but I want to put some interesting spins on the established archetype. I hope to make this an ongoing series that I update regularly and maybe one day will be able to put into novel form. I wasn’t the kind of guy who was easily swayed by the idea of “Destiny” or “Fate”. To me, these concepts were not tangible. How do you give in to fate when there is so little proof it exists? A person meets the girl of his dreams and immediately deems it as fate, acting as if the sky itself opened up and allowed this beautiful woman into his earthly realm. It’s more of a coincidence to run into a woman so desirable in so many ways and more of a coincidence if she just happens to fall for you. Still, that doesn’t stop people every year from believing in fate to the point where they block out reality itself. I’ll be honest, I didn’t believe in fate either. To me, putting your hopes and dreams on something that probably won’t happen is a waste of energy. That was, until that faithful day in September. It etched itself onto my very soul itself and changed my life forever. 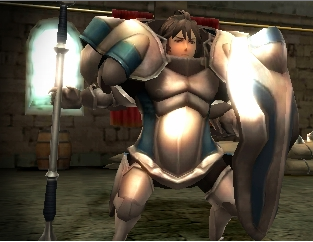 That was the day I gained the power to change fate itself. I was 22 at the time and was looking for a career to pursue. I needed something to grasp onto, I needed a plan for what I wanted to be. I was talented at many things, but I needed something tangible and attainable now. I could probably become a singer or a guitarist, but for now I needed something to put cash in my pocket. On that day, I sat on my porch and thought of what I could put my skills towards that would benefit me. As I sat and contemplated about my future, I heard a strange whistle-like sound. It sounded like whistling, but also like something akin to an air current. What could be making such a sound though? The wind was completely calm today, yet the whistling of air currents sounded immensely loud. Thinking back now, I always had a strange history with wind and air. My hat had never been blown off by the wind, nor had there ever been a strong enough wind that make it difficult for me to walk through. It wasn’t something that had me lost in thought too often, yet it didn’t stop me from questioning the oddness of it from time to time. This air current perplexed me the most, as it’s whistling felt almost like it was beckoning me forward. I tapped my greasy sneakers against the porch as the whistling became louder. And from that whistling, I heard my name being called: “Sean…” It was almost an unearthly sounding voice, like some kind of spirit calling me forth. I gave my head a good shake and ignored it, I assumed that it was just a trick that my ears were deceiving. I went back inside the house and looked for my father, he was probably the one who was actually calling me. I found him in the kitchen, he was busy buttering a piece of bread while humming to himself. My father was a kind man, always smiling and humming while doing almost anything. He stood at an impressive 6 foot 5 and has a semi-muscular build. He had the odd habit of wiggling his shoulders about as he buttered bread. I looked at his grey-ish brown hair and found that it was greasy and unkempt. It was clear to me that my father hadn’t had his daily shower yet. It took him a couple of minutes to notice me, but he turned to me and smiled once he did take notice. “Something you need, son?” The soft-spoken 50 year old asked as he continued to butter his bread. I gave the man a reassuring smile, “Don’t worry, Dad. I’m always careful.” Afterwards, I proceeded to leave the premises. I wondered what that voice was and why it was calling my name. I thought that it may be something supernatural or otherworldly, but I quickly pushed those thoughts out of my mind. Even if it was something supernatural, wouldn’t that voice choose someone more remarkable to call out to? I was just a young adult, averaging at about six feet in height. I had brown hair, baggy pants, a red T-shirt, and wrote poetry in my spare time. I wasn’t super attractive nor was I strong or athletic. I refused to chalk up the voice’s presence to the supernatural or fate, that just wasn’t in my nature. I walked along the street, my shoes kicking up dirt as I strutted across the musty sidewalk. My destination was that of the grocery store, I figured that a small Slushie would be enough to ward off the heat. It certainly was a nice day outside, so why was there a tornado warning? Looking up at the sky, it seemed remarkably calm. It lacked the usual signs of an incoming tornado. Despite this, everyone seemed convinced that the incoming storm was a reality. I was so lost in my thoughts, that I wasn’t even fully aware of where I was heading. I was snapped back to reality when I heard my name whispered to me once more. Once I exited my daydream, I found myself elsewhere. I appeared to be in a part of the city that I had never been to before. I had no clue how I got here as whenever I would daydream, I would always head to my preferred destination or finish my task. Yet, I had somehow gotten lost. I wasn’t afraid or annoyed by this turn of events, I was more confused than anything else. This part of town seemed entirely vacant, few people were on the street and even fewer cars were parked nearby. It was as if I had stumbled across a ghost town of some sort. As I wandered about trying to find my bearings, I noticed something odd. Discarded newspapers and small pieces of garbage began to fly away, being pulled in the opposite direction of where I was facing. I also noticed a car beginning to move, a car that wasn’t even turned on. This stationary vehicle was moving, almost as if it was being pulled away, The whistling of the air current intensified as I heard noises that made my heart sink. I could hear buildings being torn apart, I could hear the noise of glass shattering and I saw the end in sight. 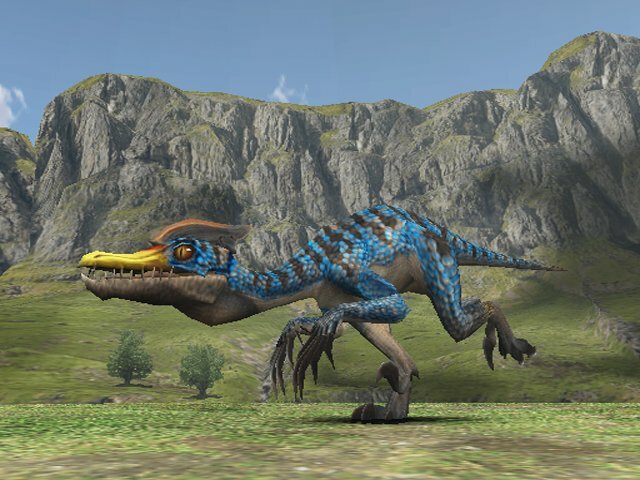 In the distance I saw something approaching, it was something I should have noticed sooner. It was a tornado and it was coming upon me fast! There was no way I could escape it, no way to run or hide. It was a weird day and I was about to meet death due to these oddities. My life had become an episode of Twilight Zone and this was about to my ending narration. I stood strong and raised my arms up to my side as the beastly winds made their way towards me. I was surprised that I hadn’t be sucked into the tornado by now, but even more surprised that I had the courage to stand like this and not run away. Any mortal man would be racked with fear, yet I felt as though I understood the cyclone. It felt as though I looked down, almost as if I was superior to it. The tornado made its way to me and the violent winds were seconds away from enveloping me. The tornado hit me, but not in the way I expected. The violent wind brushed against my face and like an egg being thrown against a wall, the tornado began to quickly break apart. The winds faded as they weakened, the tornado was dissipating. Objects that had been sucked into the tornado fell the ground as what had been a violent cyclone was now a murmur of air currents. I had stood against a tornado and it was the tornado that had paid the price. Any normal human would have been dead long before the tornado even touch him, yet I was able to stand against a maelstrom and survive. I wasn’t a normal human, I was sure I wasn’t even human at all! What was I? I decided that these questions would have to wait, I knew that people would be here soon asking questions. They’d wonder why a single man stood where a tornado once did and ask why he would survive such an event that would kill any normal man. I started running away from the tattered street. I passed by numerous buildings and found all of them destroyed. One building caught my eye, it was the only one that wasn’t damaged at all. It was named “The Pyramid” and it stood undamaged i the least. I stopped in my tracks I stared at the building, something about it was beckoning me forth. I could hear the whispering of my name again, only this time it was far louder. Something was inside that building and it wanted to meet me face to face. Was this destiny? Had I stumbled across something that mortal men could only dream of? The winds of change had taken hold of my future, I knew that these powerful winds would send me somewhere amazing. Just where would we these winds send me? I had no idea, but I had every intention to find out. I walked up to the building, taking deep breaths each step of the way. I gripped the doorknob to the building and slowly opened it, not prepared for what I would find inside. I’m pleasantly surprised with this series so far. It’s a prequel to episode 3, taking place between episodes 2 and 3 and focuses on Obi-Wan Kenobi and Anakin Skywalker’s misadventures and features new characters not in the movie. So far, I’ve only watch season 1 and part of season 2, but once I complete the series I’d like to post blog entries on each individual season as they are really good episodes. I’ve always been an avid fan of the concept of “Fan Theories”. After all, everyone has made a fan theory even if they haven’t told anyone about it or wrote it down. Because whenever you watch something you really enjoy or play a game you really like, you start to think about the lore or concepts behind that series. Everyone likes to think about what makes a particular series tick. In some cases, fan theories can explain away plot holes or even add to the viewing experience. While I’m not going to turn this into a fan theory blog, I had thought up a pretty unique fan theory on one of my favorite films: Hunchback Of Notre Dame. In this film, we are introduced to the character of Clopin. Clopin is a gypsy puppeteer and performer and is the first character we see in the movie. In fact, the entire movie is a story he’s telling to children. However, when you look at it as a story that’s being told some things just don’t add up. Which made me think about something: Is Clopin lying to us? Is the story a tall tale, or an exaggerated version of the truth? Well, let’s look at some of the oddities that Clopin tells us in the film. In the film, Clopin knows a lot of things especially for events that he wasn’t present for. For example, the introduction to the film has Frollo murdering a gypsy woman and attempts to kill a baby as well due to it’s ugliness (Did I mention this movie is for kids?) Before he can murder the child, a priest runs in and makes Frollo responsible for the child due to his action. Now, how could Clopin possibly know all this? One could make the argument that the priest told them, but we never really saw Clopin interacting with the priest at all during film. On top of that, the Archdeacon wasn’t present during the pursuit of the Gypsy so he wouldn’t have known the scenes that lead up to it. Sure, Frollo says that he chased her down because she ran away, but how would the Archdeacon have found out about the boat or the fact that Gypsies we’re trying to make it into town without being seen? It’s not like Frollo told the Archdeacon about this, unless it was down off-screen. Even if that was the case, there are still things Clopin should not know. The biggest thing is Frollo’s Hellfire scene. When he sings this song, he’s completely alone. Sure, a guard bursts in halfway through the song but I doubt he knew what was actually going on in the room. After Frollo signs about his lust for Esmerelda, the scene cuts to him the next day telling Phoebus that he had “A bit of trouble with the fireplace”. Frollo tells nobody about the events, so how could Clopin possibly know what Frollo was singing about? It’s entirely possible that Clopin added the scene in as an explanation to why Frollo was so lustful towards Esmerelda. An oddity of the film many people point out are the Gargoyles. One might think that the Gargoyles are Quasimodo’s imaginary friends, which is what the film leads you to believe. However, they are shown interacting with animals such as the goat even when Quasimodo isn’t present. On top of that, they actually join in the final battle despite not supposedly being real. So, are they real or not? This isn’t one of the Disney films where magic exists, there is no magic in this film aside from slights of hand or illusions. The most likely explanation is that Clopin made the Gargoyles up. If he was going to relate this story to children, he’d need to have side-characters that relate to Quasimodo in some way. This is exactly what the Gargoyles did, acting as Quasimodo’s conscience in a way. 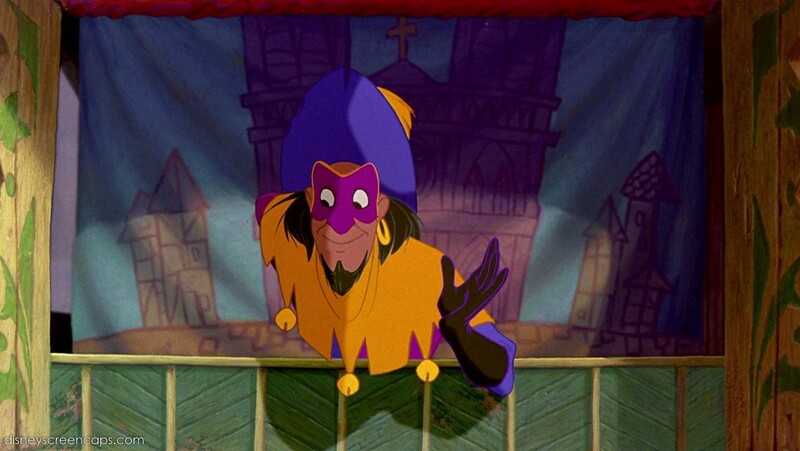 Clopin most like weaved the Gargoyles into the tale and had them act as both illusions and as real beings. Having creatures that are unnatural or magic in nature is a way to get kids interested in a story. One of the cardinal ways to not tell a story is to not make yourself into a murderer or a person of negative intent. I recall an author who wrote a book about a murder that ended up being remarkably similar to a real-life murder. So much so in fact that it turns out he was the murderer as events in the story were exactly the same as the murder and that the author did have ties to the person who was murdered in real-life. I bring this up, because in Clopin’s story he attempts to murder both the protagonists by hanging while believing them to be spies. Clopin’s song seems to insinuate that this isn’t the first time he’s murdered someone. He’s seen playing with skulls and said things like “Here in the Court Of Miracles where it’s a miracle if you get out alive!” A story you tell to children or adults should not feature yourself in the act of attempted murder. If what he’s telling is real, than the guards could have easily searched the Court Of Miracles for evidence of fowl play. Especially because the Court Of Miracles is found by the guards halfway through the movie. Telling a story that is based off truths such as that could get you thrown in prison for life. However, if the story was falsified then Clopin wouldn’t actually be in jeopardy. Clopin could have said that he had a tendency to put trespassers to the noose, but if it turned out to be false then the guards wouldn’t have reason to arrest him. If the guards knew it was a harmless story, they would let him continue to spread the story without repercussions. So, now that we’ve seen all the evidence, what’s the verdict? Well, it’s entirely possible that Clopin is telling a tall tale or altering parts of the story to make it more entertaining. In fact, if one realyl thinks about it Clopin could be the personification of Disney itself in the film. Taking a well-established and famous story and putting a spin on it to make it more suitable for children while still retaining a lot of thematic and dark elements. Then again, maybe this stuff did all really happen. Maybe someone was watching Frollo’s room while he sung Hellfire, maybe Clopin really did put people to the noose even if they weren’t entirely guilty. Who’s to say? Telling a story to someone back in the 1400s isn’t the same as it was today. Their was no video cameras or photography devices back then. Clopin’s version of the story could be factual the events of the film or be a retelling. It’s something that I don’t think Disney itself would address, as most giant organizations tend not to go in specifics on fan theories. When it comes to the many Star Wars movies, my favorite tends to either be episode 5 or Episode 3. I especially enjoyed Episode 3 because of how surprisingly good it was. The prequels had a nasty tendency to be boring, weird, or just have generally bad characters. However, Episode 3 managed to not only be entertaining but also memorable and enjoyable. It was rather surprising, especially considering the nature of the Star Wars films at the time. The prequel trilogy of Star Wars was a series of films dedicated to show the fall of Anakin Skywalker over to the dark side and the rise of The Empire. Episode 3 was the final film in the prequel trilogy, depicting an epic confrontation between Anakin and Obi-Wan as well as showing us the downfall of both The Republic and The Seperatists. It was a rather epic film, full of memorable scenes and great action sequences. One of the few problems I had with the film was the portrayal of General Grievous. General Grievous was initially introduced in the Star Wars: Clone Wars animated series. After appearing in that show, he was later depicted in the film itself. However, he more of a coward and wuss than an unstoppable force of nature. In the cartoon, Grievous could take on multiple Jedis at once and come out victorious. In this film, he was defeated by a singular Jedi. Still, it was a very solid confrontation scene. This film depicted everything that went wrong and led up to the events of Episode IV. If you wish to be filled in some more on the proceedings between episodes 3 and 4 I suggest watching Star Wars: Rebels and playing the videogame Star Wars: The Force Unleashed. Episode 3 will always remain a classic Star Wars movie to me, despite the films leading up to it being less than stellar. I look forward to Episode 7, I hope it’s just as good as both Episodes 3 and 5. May and June tend to be the times when most conventions start, at least the big ones. I remember the first comic book convention I went to, it was here in my hometown. It was a small offering, their wasn’t a whole lot of celebs there and the place was relatively tiny. Still, I enjoyed it quite a bit! At this convention, I picked up Mazinkaiser for a very cheap price. All seven episodes on one DVD for about 6 dollars and 67 cents. That’s a pretty sweet deal, especially when you take into consideration the price you’d pay for it at a store which would range from 20 to 30 dollars. It was my first taste of a convention, but again it was super small. It wasn’t a super big convention and it didn’t have a lot to do. It was tiny and cramped, but it wasn’t an awful first convention. I stayed there for about an hour or two. Next year I spent a lot more time there, but still found the convention to be immensely tiny. Nowadays I stick to bigger cons that have more to do. The last con I went to had tons of guests like Brad Swaile and Tyler Mane. I’ll never forget my first convention, it truly was a magical time. If you’re a nerd or just some person who’s interested in nerdy things I reccomend going to a convention. Unless you live out in the middle of nowhere with no cities or towns within miles. If that’s the case, I recommend relocating to a large city or just simply watching a convention live on television. Many of you cartoon fans probably have watched LewToons, it’s a series on Youtube detailing cartoons and cartoon series in various forms. LewToons is primarily known for his Gravity Falls theory videos and his Top 10 lists. Well, a year ago I watched LewToons “Top 10 Cartoon Facts & Theories Video” and came across his listing for 8th place. It was a fact about how the original Snow White animation stills go for a crap ton of money and are super rare and how there’s a bunch of them in the world to this day. Upon watching the video, a memory I had of my childhood re-entered my mind for the first time in almost a decade. I recall having what I believed to be some sort of Snow White poster, at least that’s what I thought it was when I was a kid. I’m assuming my parents also thought the same thing about it. It was a Snow White picture inside a white frame and looked like a scene right out of the movie. And if I remember correctly, their may have been an autograph by Walt Disney in the corner. My memories of this event are a little muddled, but if what I’m thinking is correct I may have had a rare one-of-a-kind Snow White animation cell when I was a kid. And neither my family nor my childhood self knew of it’s rarity or immense value. Or, it could have actually just been a poster. I don’t think there’s any official way I could find out. I’m pretty sure my parents either tossed it out or sold it at a garage sale and I don’t remember it being in the best of quality either. So, how did we happen across this Snow White animation cell? I have no clue to be entirely honest. My parents don’t remember the poster, nor does my sister. In fact, I’m the only one who seems to remember the Snow White poster. I also remember the other Disney posters we had such as Pinocchio and Hercules, which I’m sure existed. I do recall a Snow White poster of some caliber, but it’s entirely possible that I’m remembering it incorrectly. Could it be true? I’ll never really know, but if it is true I do lament the fact that my parents could have struck it rich by selling it for a ton of cash. Oh well, you win some you lose some. Hopefully, if that was one of the legendary animation cells then the person who has it now is sitting pretty with all that cash.